Firefighters have cut a spike off the 'B of the Bang' sculpture outside the City of Manchester stadium after it was found hanging loose. 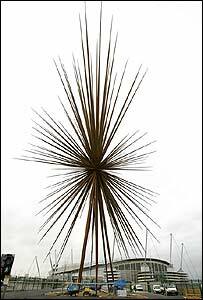 It is the second time this year the 184ft (56m) sculpture, designed to look like an exploding firework, has had safety problems. In January the tip of one of its 7ft (2.1m) spikes fell to the ground before it was officially opened. The sculpture is made up of 200 solid steel columns. Its first safety scare came a week before it was officially unveiled by former Olympic champion Linford Christie.